What it is, where it goes, who’s racing, which stage to watch, TV listings, and basically all of the basic basics. 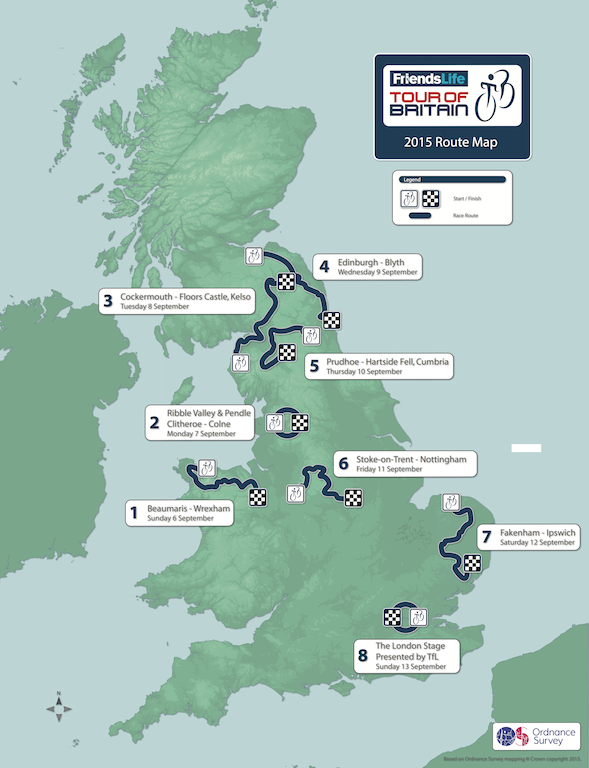 The Tour of Britain is the biggest bike race in Britain. 2015 is the twelfth year of the race in its current format. The event’s roots can be traced back to the legendary Milk Race which ran from after the Second World War until the 1990’s. It’s the race in the UK that attracts the World’s top teams and riders and it’s the one that all the UK-based professional teams strive to ride. The race usually covers a large chunk of England with Wales and Scotland visited too. The route always attracts moans from some quarters but there’s only so much of the UK you can cover in 8 days with auitable stage distances. Another factor in deciding the route is the towns and cities which are actually prepared to host the stage starts and finishes. This factor dictates the route significantly. This year sees two of the biggest ever stars of UK cycling take part. Sir Bradley Wiggins (Team WIGGINS) and Mark Cavendish (Etixx-QuickStep) will both be riding on home soil. They face a very strong line up including the Tour de France sprint star André Greipel (Lotto-Soudal) and the world’s top teams including SKY, Etixx-QuickStep, BMC, Movistar, Tinkoff-Saxo and Cannondale-Garmin. The UK’s top ranked professional cycling teams will also be taking part and although they are sort of ‘second division’ teams they always rise to the occasion and acquit themselves well in the race. The only down side is that there is no individual time trial in this year’s race so we won’t get the chance to see Wiggo in his world champion stripes one last time unfortunately. The race is eight days long and is one of the toughest editions ever with three stages over 200kms. It starts in Beaumaris, Anglesey, on Sunday 6th September with a 178km stage to Wrexham. It then heads to the north west of England before a stage in Scotland and then back down to the east of England – there’s a fair bit of driving between stages – before it all finishes in London with an 87km flat stage for the sprinters on Sunday 13th September. This year’s race covers a total of 1,443km (902 miles) over 8 stages. Are the stages all equal length? The shortest is the last stage (stage 8) which is an 87km circuit race round the streets of London and is always a showcase for the sprinters. The longest road stage is the day before (stage 7) which is a whopping 227km round East Anglia. The rest aren’t short either, ranging from 160km to a couple of 2ookm+ days. Riders must ride and finish all stages and the overall winner will be the person who covers all the stages in the lowest aggregate time. What jerseys are there to race for? Apart from the overall winner and stage winners there are also several other jersey classifications for riders to battle for. Yellow Jersey (Leader’s jersey) – rider with the lowest aggregate time overall. Green Jersey (Points jersey) – the most consistent placed finisher on each stage. Polka Dot Jersey – (Climber’s jersey) – the most consistent rider in the mountains both along the route and at finishes. Sprints Jersey – There will be intermediate sprint points along the route each day with a jersey awarded to the rider with the highest points overall. The Tour of Britain is always a difficult race to call with the unknown nature of the course providing exciting and unpredictable racing. 2014 winner Dylan Van Baarle (Cannondale-Garmin) returns with a strong squad to defend the title. Although his form is unknown at the moment we’re sure he’ll be up for repeating last year’s win. Edvald Boasson Hagen (MTN-Qhubeka) is another former winner who lines up with a strong squad. He will be keen to at least go for some stage wins if not the overall. The punchy route will suit Classics star Zdenek Stybar (Etixx-QuickStep). Or will he be too busy working for Cav in the sprint stages? Sir Bradley Wiggins (Team WIGGINS) won the event in 2013 and although he has technically retired from top level road racing he is always keen to show himself to the UK public. The lack of a time trial stage may reduce his chances of a stage and/or overall win but he will be a crowd favourite regardless. There are twenty teams racing in total. Which of these teams are the British ones? This is the biggest race of the year for domestic based professional teams. It’s a chance for riders to show themselves against a world class field. Which should be the best stages to watch? This stage goes up and down all day much like an Ardennes Classic. Riders tackle the legendary Nick O’Pendle climb shortly after the start so expect to see action early doors and throughout the rest of this stage. The summit finish on Hartside Pass, the highest ever used for a finish of the modern Tour of Britain, will see the overall contenders showing their colours. This long stage provides the last chance for the overall contenders to try and make time gaps before the circuit race in London. Expect the wind to play apart in this stage with the flat route in the East of England. This is a real sprinter’s stage taking place amongst the landmarks of the capital city. Expect it to be fast, noisy and good for photographs with iconic backdrops. Can I watch it on the telly? Yes, ITV and British Eurosport will be showing the race live each day as well as highlights each evening. Is there a women’s Tour of Britain? Yes, the Aviva Women’s Tour is the female version of the race taking place in June over five days. Tagged aviva women's tour, mark cavendish, pro cycling, racing, sir bradley wiggins, team sky, tob, tour of britain, wiggo. Bookmark the permalink.